2017 Moto Guzzi Eldorado. Picture credits - Moto Guzzi. Submit more pictures. The flash forward effect is distinguished by the complex headlight shape equipped with LED daylight running light (DRL) a unique piece of design that is a work of art itself. The instrument panel is equally striking, contained in a 150 mm diameter circular panel with the analog rev counter scale finding its place along the external circumference and a multifunction full-matrix suspended display at the centre, all packaged neatly, like a luxury watch, in a bright chromed housing. 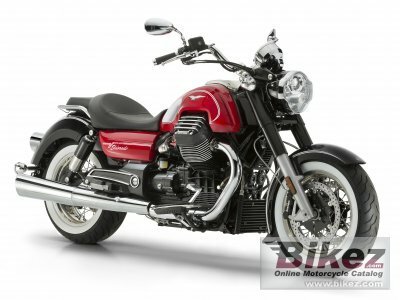 Ask questions Join the 17 Moto Guzzi Eldorado discussion group or the general Moto Guzzi discussion group. Bikez has discussion forums for every bike. View comments, questions and answers at the 2017 Moto Guzzi Eldorado discussion group. You can sign up for e-mail notifications when other riders answer you. If you have extensive experience with the MC, please send us a review. If you consider buying this bike, you should view the list of related motorbikes Look at photos. Compare technical specs. And check out the rating of the bike's engine performance, reliability, repair costs, etc. You can compare the rating with other bikes.